These are samples of our Wooden Show/Pleasure Carts custom made by Amish artisans. These carts come with many options included but can be customized to your specific requirements. These carts are also very lightweight and very well balanced. 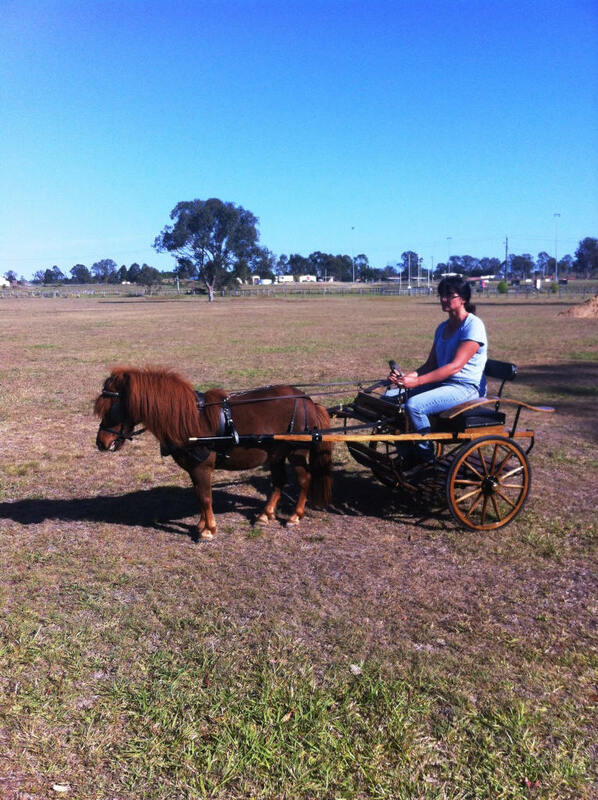 They have full-scale carriage springs, which give you a very smooth ride over grass, dirt roads, wooded trails and paved roads. 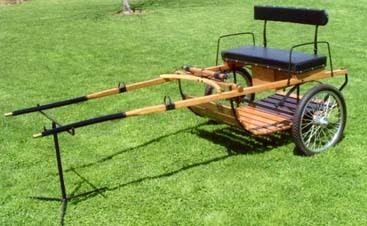 The wooded wheels are also interchangeable with wire wheels. 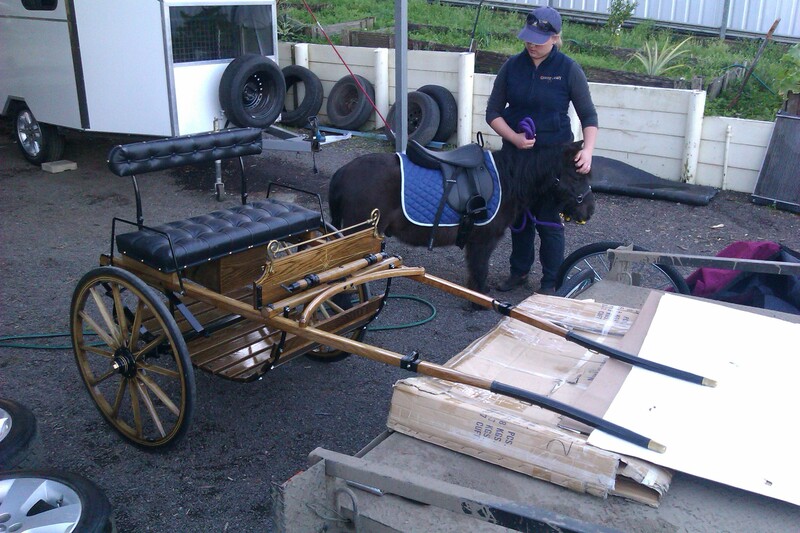 These carts can also be scaled for small pony size or large pony size. These carts are shipped UPS/FedEx ground. The hubs are approximately 2" on the wooden wheels (half way between flush and standard). Cart Delivery is approximately four weeks from time of order. My Show/Pleasure cart with wooden shafts and wooden wheels cost $895. 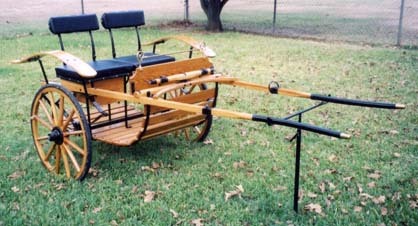 The carriage with wire wheels is $695 for 20" and plus $65 for 26" wheels. If your horse is <33" then a 20" wheel is used. If your horse is > 38 and less than 43", please add $50 for pony size. PONY size (11-13H) is $1045. 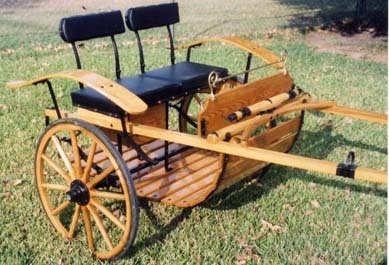 A FOLDING seatback is standard on all wooden models. Spares box comes standard. The following options may be added if desired: wooden dash $65, patent leather dash $120, brass rein rail $115, chrome (over brass) rein rail $115, brass or chrome color whip socket $18, brass hubs $55, round or flat or slatted fenders ($115-2 of them ~4"x22"), split bench seat $100, dashboard BOX tray $75 (need to order dashboard unless ordering Full Meadowbrook which comes with a dash), and block brake $110. Tufted naugahyde or bedford cloth $295. 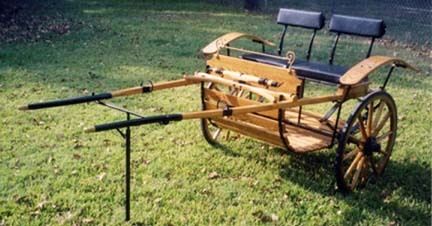 The mini sleigh runners (up to 38" horse) cost $205 and the small pony size (>38"-42" horse) is $225. Tubeless (SOLID) Rubber Tire Set is available sold separately: 20" or 26" for $185. To upgrade your pneumatic tire order to a tubeless (SOLID rubber) set, add $85. HEAVY DUTY SPRING upgrade is recommended above a 38" horse for $65. 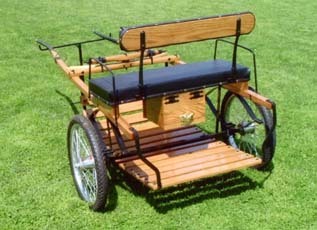 The Full Meadowbrook is the fully loaded (dash, whip socket, split seat, spares box, fenders) Show/Pleasure cart without the rein rail and is $1195 for wooden wheels or $995 for wire. 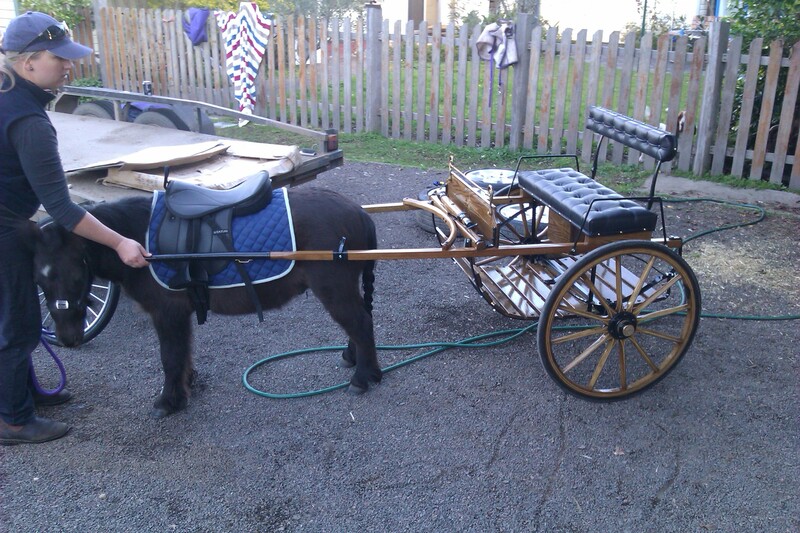 The weight ranges from 123 pounds for mini size to 150 pounds for small pony size with heavy duty springs. Rein rail and heavier springs not included. This cart ships freight so we will need to provide you a quote based on your zipcode. 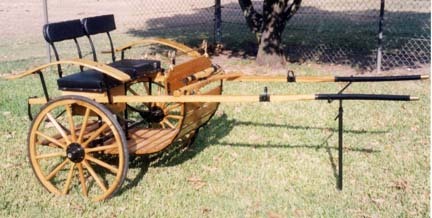 The PONY Full Meadowbrook is the fully loaded (dash, whip socket, split seat, spares box, fenders) Show/Pleasure cart without the rein rail and is $1305. Rein rail not included. This cart ships freight so we will need to provide you a quote based on your zipcode.